Years later, as I flew to Larkana to interview the aristocratic Mumtaz Bhutto at his ancestral home, I found he had also not forgiven the PPP “riff raff” for their challenge to the feudal lords. With his cool demeanor and long moustache, Mumtaz spoke slow clipped sentences in British English. It established his credentials as a barrister-at-law from Lincoln’s Inn, U.K. Well-spoken, and comfortable with hosting Western diplomats in his Karachi mansion, Mumtaz was just as at ease in his sprawling estate as in the otherwise poor and underdeveloped Larkana. The Larkana feudal had stayed away from Benazir’s attempts to reorganize the PPP after her father was hanged by the military. Instead, he had watched incredulously as Benazir had worked her way up through the old boy network of entrenched male feudals. Mumtaz came to receive me at his gates in Larkana after my hosts dropped me off from the airport. We walked back to his magnificent estate. Rows of elderly men touched his feet in reverence all the way back to the house. I felt guilty that grown men prostrated themselves. But, the Larkana feudal walked erect, scarcely looking down at the emaciated peasants. This was the traditional welcome for a man who owns lands in Larkana, Jacobabad and Shahdadkot and in the adjoining Balochistan province. Sitting in the shade in Mumtaz Bhutto’s brick courtyard where the afternoon sun gently sizzled, we chatted after I finished interviewing him. An avid reader of Dawn, he told me he was familiar with my name. It did not surprise me, knowing that Western-educated feudal politicians and bureaucrats alike read the newspaper for which I wrote. At the same time, he complained that politicians shot into prominence – and I knew he hinted at Benazir – because of the media attention they received. Perhaps the inordinate attention Benazir had received in the press after her exile overseas had seemed excessive to her uncle. In particular, he seemed irked by how green Benazir was for Pakistan’s seamy politics. “You know that when Benazir first came to me, she didn’t know anyone. Instead, she asked that I introduce her to people,” Mumtaz told me. “Yes,” he said in his non-committal way. But I knew that as a political rival Mumtaz was least likely to introduce his ambitious niece to the powerbrokers. Mumtaz was a man who belonged to another era, another system. His style was in sharp contrast to Benazir’s father, Zulfikar Ali Bhutto. Bhutto had used his fiery speeches to empower peasants and the working class, who had, for centuries, cringed before the aristocracy. 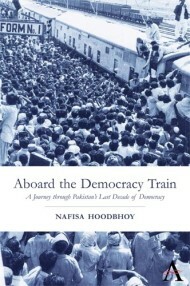 Apart from being a demagogue, Bhutto had left lasting effects. My visit to Larkana – the ancestral home of the Bhuttos – gave me an insight into the contrasting style of the rival politicians from the best-known political family of Sindh. We sat in the courtyard where the sounds of chirping birds and the fresh country air made me glad to be out of Karachi city. As the servants brought tea, Mumtaz poked fun at Benazir’s poor knowledge of her mother tongue, Sindhi. It was an issue I could identify with myself: like Benazir, I was born a Sindhi in Karachi. Being primarily educated in Western institutions, my parents had never encouraged me to learn my own language. But Mumtaz was relentless with his niece. “When Benazir comes to Larkana and I hear her speeches in Sindhi blaring out from the loudspeakers, I want to cover my ears,” he laughed sardonically. He saw me smile, in spite of myself. Mumtaz had reserved his deepest contempt for the commoners who joined the PPP under Benazir. I could see how difficult it had been for him to digest the victory of a PPP candidate of “inferior standing” like Deedar Hussain Shah, who won against him in Larkana. “You know that fellow (Deedar Shah) used to be my kumdar (manager of lands) – who waited outside my office to get my attention,” he told me. “And now he has the nerve to stand against me,” he added in disgust. That came as news to me. I knew Deedar Shah as one of the best-read parliamentarians in the Sindh Assembly. We left the ancestral courtyard after Mumtaz offered to take me on a tour of his ancestral lands in Larkana in his Pajero jeep. It was an unusual step for a feudal to drive a vehicle with an unveiled woman, but there were important things on my host’s mind. As we drove through his constituency, he told me to note the broken roads and a gaping gutter in Naudero, Larkana where a child had fallen a few days ago. He cited them as examples of how his humble PPP rival Deedar Shah had failed to fulfill the needs of the community. Both Mumtaz Bhutto and his PPP opponent Deedar Hussein Shah, knew from experience that getting funds from the Punjab was like getting blood out of a stone. Deedar Shah grew hoarse in the Sindh Assembly as he appealed for development funds for interior Sindh. Eventually he quit politics and became a judge. As a prominent feudal lord, Mumtaz claimed he would have more leverage with the federal government in getting funds for rural Sindh. That, I suspected, was true. This entry was posted in Excerpts, Pakistan Politics. Bookmark the permalink. PMLN Quid NAWAZ SHARIF should pay attention to reservations, disputes and differences of all workers/leaders in country especially Sindh. 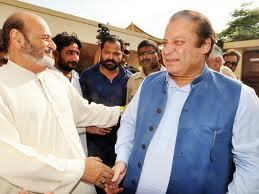 Mumtaz Bhutto, Ghous Ali Shah, Arbab Rahim,Liaqat Jatoi,Saranjam Khan,Zulfiqar Khosa must be engaged in party matters again and given due status in party.Moreover, it is important for Mr. NAWAZ to talk with Javed Hashmi and include him in PMLN again.